Through HeadButler.com, Jesse Kornbluth acts as a cultural concierge by making recommendations on books, films and music. When I started working on the web in long ago 1996, site visits lasted an average of 8 seconds — because that’s how long it took for the site to load and for the visitor to see that he/she really did not want to be there. 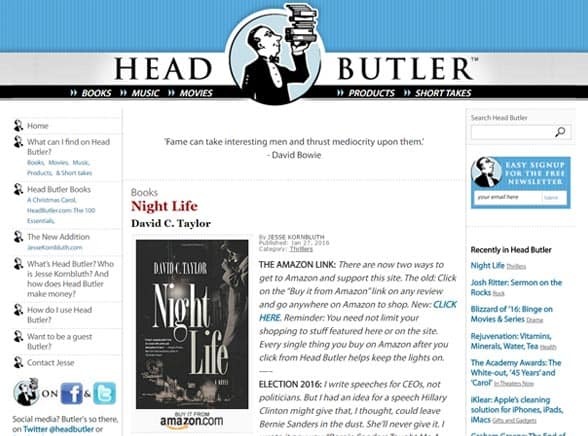 The Internet is faster now, but I took that lesson to heart when I was launching HeadButler.com, a concierge site “for people with more taste than time,” in 2004. I wanted screens so clean that the visitor was onboard and reading in a flash, with navigation so simple that even I — a tech idiot — could find my way around. Any other company would have wanted to add bells and whistles that impressed the client and padded the bill. Carol Fitzgerald and her team designed and built a site so crisp that, all these years later, we’ve only had to tweak it a bit. Has HeadButler.com ever won design awards? No, and it never will. But over the years, many readers have written to thank me for the site’s elegance and functionality. And reader satisfaction is what it’s all about.